Money isn't everything. 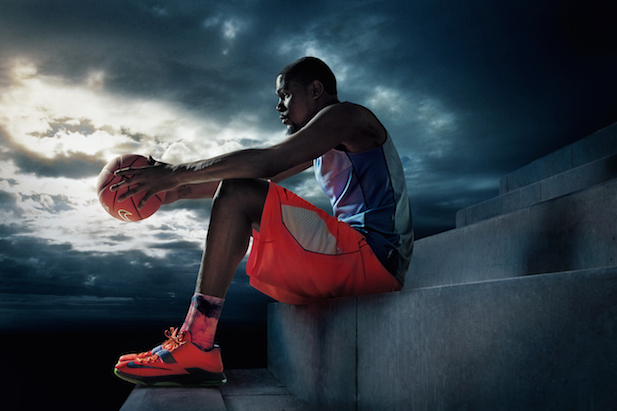 Here's why Kevin Durant should keep his sneaker endorsement with Nike. $30 million per year is an absurd amount of money. Despite being a sum that the average American probably won’t earn working a 9-5 job in their lifetime, it’s also lofty in terms of today’s sneaker endorsement deals. Regardless of dollar figures most people can only dream of making, $30 million a year is how much Under Armour is reportedly willing to pay Kevin Durant annually to endorse its logo instead of a Swoosh. Making the jump from Nike to the young (just shy of 20 years-old) Baltimore-based sports brand for that type of payoff may seem like a no-brainer for many folks (most likely including Durant’s business manager), but there’s more than just dollars and cents at stake. There is also a question of legacy, and the seven years Durant—and by default Nike—has invested in building the KD brand. How would the common consumer know about Durant’s weird fascination with meteorology or his aunt Pearl, who’s now famous for making the Thunder star peanut butter and jelly sandwiches, if it wasn’t for Nike telling those stories through sneakers? Nike may not be willing to fork over $30 million a year to keep one of of the top guns in basketball today (or maybe it is? ), but let’s not forget the fact that it’s still the number-one athletic brand in the world. Not to say that Under Armour doesn’t have a solid team of designers like Dave Dombrow and Tom Spence. UA has already made a lot of strides in footwear with innovations like Speedform and ClutchFit, but it’s still fairly new when it comes to the footwear market. In basketball specifically, Under Armour has had a few stumbles early on that have included the phasing out of Brandon Jennings signature line and losing endorsers Derrick Williams and DeAndre Jordan. Leaving Nike would mean leaving over 40 years of sneaker design intel and vast resources in sports research. An elite athlete must consider comfort first—both on foot, and with the design team supporting him. The chemistry built between Nike Basketball Design Director Leo Chang and Durant over the the past few years in shaping the KD line not only proved successful at store shelves (the KD sneaker line is the second best-selling in basketball right next to LeBron James, according to SportsOneSource), but has also blossomed in alignment with Durant’s career. Durant put up his best numbers as a pro last NBA season, averaging a career-high 32 ppg, leading to his first league MVP honors. This might just be a sneaker enthusiast theorizing, but if you look at the correlation between Nike’s KD line and Durant’s stats - Money, it’s gotta be the shoes. The “homecoming” card, which my colleague Brandon Richard eloquently wrote about yesterday, is surely one that Under Armour will try to play in hopes to lure Durant. 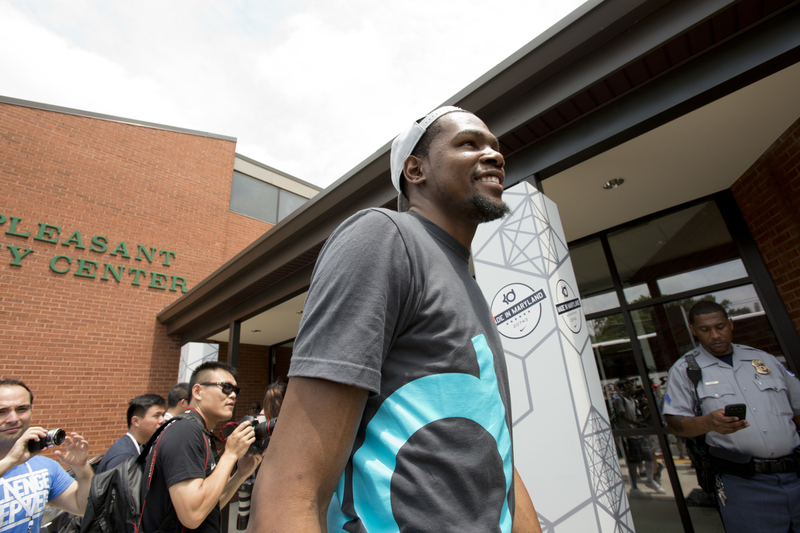 Emotional sentiment aside, who’s to say Durant can’t have an impact on his hometown with Nike? It was Nike that took national media on a tour to Durant’s hometown of Seat Pleasant, MD back in 2013. 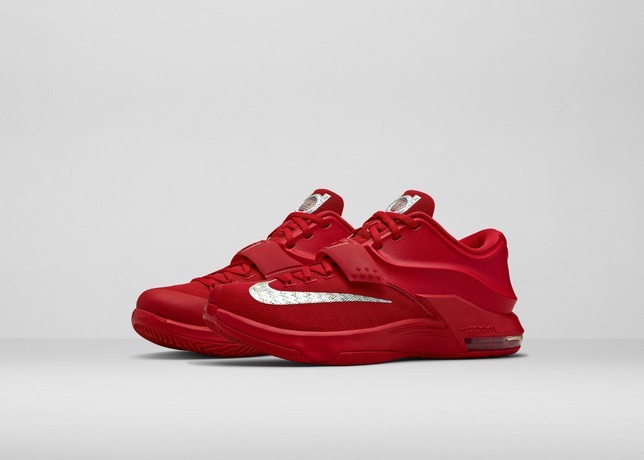 More recently, when the brand officially unveiled the KD 7 in Washington, D.C. earlier this summer, they did it in front of an audience comprised of DMV youth. So, consider this: Is a mid-career change really worth it? Sometimes change is good, but in KD’s case he’s probably better off staying with the brand he’s worn throughout high school, college, and literally been with him every step of the way. What’s $30 million to someone who’s already a multi-millionaire anyway? Well, it’s $30 million. But for Durant, his relationship with Nike may be worth more than that. Gerald Flores is the Editor-In-Chief of Sole Collector and you can follow him on Twitter here.